With the cash booking, you can easily make all bookings related to cashiers, bank accounts, post accounts. Thanks to this view, no need to know debit and credit, only inflow and outflow, easy no? In the menu Booking, select the button “Cash booking”. Menu Cash booking: Select to make cash booking. Menu Booking: Select to make simple bookings. Menu Bookings list: Select to see all bookings passed in the accounting. Menu Models: Select to see the list of models. 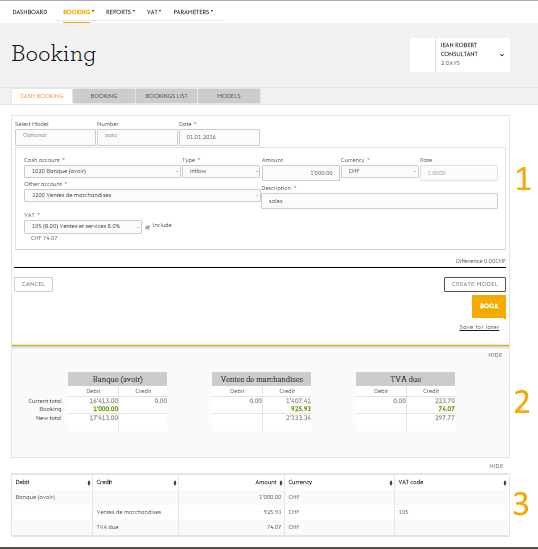 Model (optional): Input the model code to be used or input a new code to save the booking as model. Number(automatic): Booking’s number. This number is automatic but you can input yours if needed. Rate: Currency change rate. This rate can be manually changed during the booking. Description: Booking’s description – to easily find the booking later. Save the booking for later. The booking is not passed in the accounting and do not influence the balance sheet and the income statement. Each account has a current total (total before booking), booking in green if the account increases and in red if account decreases. New total (total after booking). Some accounts increase in debit and some in credit. Hide button: Select to hide this part. The table describes the booking and how it is booked in the accounting. For each debit and credit, you can see which amount is booked and if VAT is used. This table can be used to check before booking and also to learn accounting. We are available to answer questions under support@ezycount.ch.. We answer within 48 hours.